The following psychic prophecies of World War 3, as shown to me, John Le Sainte, by the Spirit and Soul of Nostradamus is among the most frightening that I have seen so far as the pain and suffering that it brings to the entire world. These are the Complete predictions and prophecies of the coming World War 3 explained and interpreted. World War Three is the war of information and technology. It is the world war, against the rights and freedoms of all human beings on Earth. I have seen several total psychic visions since the first in 2003 of this one terrible technology. Nostradamus and I have discussed these visions more than any others. Two related New Written Quatrains are explained here. I begin with 1-18 then include 1-19 at the end of this posting. Here Nostradamus and I explain and interpret in very complete detail the true meaning of the number 666. World War 3 will be called the War of information and Technology, and it is being waged right now before your eyes, yet you are all blind to it. The pain of this number , 666 and related technology is already upon YOU, Your Family and the Entire World already. As a cancer may be stopped with early treatment, so must the factors of 666 and the FLEA bust be dealt with NOW, Today! These statements, descriptions and Quatrains are not Guesses, they ARE the truth, and will be the destiny of the world if you do not act NOW! It would be the greatest Joy of Nostradamus and myself for these to be prevented. We hope that you children and children's children read these predictions of World War 3 the information and technology wars, in 200 years and remark, "Look, John Le Sainte was wrong". That would mean that YOU took action to stop these insidious and horrible, events and devices today, in 2008. Our writings would have brought a relief of great suffering to all the peoples of the world. The descriptions here focus on the United States, however, I have seen psychic visions as guided by Nostradamus of these devices across many countries of the world in a few short decades; China, Russia, Philippines, Japan, Germany, France, Italy, Spain, Belgium, Sweden, Denmark, Norway, The Former Soviet Republics, North Korea, India, Pakistan, Poland, Canada, Mexico, Central America, Brazil, Africa, and many others. Australia and New Zealand being hold outs not permitting this technology. Please read ALL of my blog posts starting from the first one for a full understanding of my relationship with the True Soul and Spirit of Nostradamus. Please Link to my Blog and Writings. The Mark of the Beast, 666 is upon us all, May God help us. The "Flea" is the first sign of the coming World War 3. Shall track your every motion. From the Desert to the Ocean. Note: Next Follows a greatly expanded explanation of the previous and immediately following quatrains. Nostradamus has reviewed my writings and given to me, John Le Sainte, his full blessing to allow the true and full meaning of these predictions and Prophecies for our future to be completely revealed. The future horrors will soon begin with the birth of a new device and technology. A small electronic chip with several very short, minuscule wires giving it the appearance of tiny insect with legs is implanted just below the skin in the right hand or just between the eyes in the forehead. It becomes a virtual universal "Smart Card", similar to Speed Pass or Easy Pass chips used at highway toll booths today. The commonly used name for these implanted devices will be "Fleas". These begin in the Military, Prisons and Sensitive Government facilities to track a person's exact location and to allow or deny access to restricted areas. There is no battery or power source inside. They are somehow powered by the tracking units as you approach. Just about every packaged food product or retail merchandise item will have something similar embedded. They will also be sewn into socks and molded into shoe bottoms. They will be difficult to remove from most clothing or merchandise without damage. Stores and public areas will be able to scan your Flea and the embedded chips in your clothing to customize advertising displays in public or private stores as you approach. These devices will soon be implanted in all criminals. Sexual offenders will be tracked and arrested for going near restricted areas. Past criminals of Shoplifting or violent offenses would be forbidden from entering stores if the Corporate owners choose to exclude them. The simple installation procedure under the skin, and it's convenience in everyday life, convinces many people to be willingly implanted...at first. You walk up to an ATM machine and it automatically brings up your account information without a card or password key. The code at first is impossible to mimic as it also scans and broadcasts your unique body chemistry. Your car starts automatically when you sit in the drivers seat with the seat belt fastened and you tap the brake. If you are Diabetic, your blood sugar will be monitored and sent to your cell phone or another remote receiver. A heart rate change could signal an immediate call to paramedics. Dangerous medical conditions could be reported such as High Blood Pressure. Constant Endorphin monitoring and body chemical analysis will detect illegal drug or excessive alcohol use. Elderly Nursing home individuals will be tracked to prevent them from "Wandering off". The system will become ubiquitous throughout the world with chips being implanted in everyone, even newly born babies will be implanted to prevent them from being stolen. The Immediate availability of personal information would allow stores to deny access if you have ever shoplifted, or been convicted of a felony. Banks to deny access to services if the chip discloses that you could be a bad risk for a loan or have a history of overdrawing accounts. Apparently even in 2008 the exact median between the best and worst credit rating score is 666. To be acceptable for credit in a society lacking paper and coin currency one MUST have a rating above this mark. Everyone below 666 will be called a 666 no matter how low the rating goes. Did you realize that the mark was already upon you? Already Today automobile insurers are charging higher rates to people with poor credit rating even though they have perfect driving records. This is only the beginning of the Bad Credit Prejudice. Imagine a retail store entrance Flea Reader scans you and denies access based on the reasoning that your lower credit score might tend to predict that you are more likely to shoplift or buy less profitable articles. An individual is singled out and denied entrance to all retail stores because they had won an injury settlement for being hurt when a store display collapsed onto them. The store denies access to these people that might be more inclined to sue them for injuries. All businesses with readers will be programmed to determine whom to allow in and whom to exclude. What store would allow in a Past Felon? Reformed Drug User? Known Sexual Offender? Someone with no Income? The exclusions begin to cripple the poorer citizens, and many other innocent people. The Flea readers will soon be located in millions of stationery locations, every 100 feet along every roadway, at every intersection, every doorway, every cell phone, every retail store, every bank locations, every computer, post office, library, school, hospital, doctor's office, public park, car, bus....a list that includes just about every imaginable place a computer connected to the Internet might be. Every action and motion in your life will be closely tracked, recorded forever and be subject to scrutiny at any time. This is only 10-20 years away if we don't stop it as the great controlling evil it becomes. The system is manipulated by the overseers of the system for great corruption. It would be impossible for anyone to hide in the world unless you controlled the system. If you didn't show up for work on time, your employer could immediately check your location. You will find that a select group are exempt from active Flea monitoring. Mostly Corporate Leaders, The very Wealthy, Politicians and Military leaders supposedly to "Protect Them" from being targets of assassination or other criminal actions. However, It just gives freedom for unimaginable crimes. Now you are just beginning to see the true meaning of the coming, and already begun, World War 3, and how it is being waged upon individuals. If you are above the ideal weight you would be forbidden from buying certain foods in the store check line. To keep your health insurance you will be ordered to exercise at a gym for exact times as prescribed. To not follow the diet regimen to the letter would be a loss of Health Insurance or similar benefits. All monitored by the Flea Device implanted inside you. Your food purchases will be closely monitored for nutrition and calorie count. Everything you buy and own will be itemized forever down to the last stick of gum. Imagine bringing your cart up to the grocery checkout and being told you are forbidden from buying 2% milk because you are 23% over the ideal fat mass index and the sale is not allowed as ordered by the government. Oddly Enough, you can still buy hard alcohol, no matter what your health condition, if you have never been convicted of any alcohol related offense. A drunk driving offender would not only be forbidden from driving, but will lose access to stores or restaurants where any liquor is sold forever. If alcohol is sensed by the Flea in this individuals blood stream, authorities will be summoned as the offender moves near the first Flea receiving device. The Criminal penalties are far more severe in the coming years then they are now. Today, America imprisons the greatest percent of it's population than any other nation of the world! Even more than China or Russia. One of every fifty Americans living today is in prison. This will rise to almost one in every twenty five within just 20 years. Another 5 people in twenty five will be on "Limited Access Status" or "LAS" to many places and services we take for granted today. A prison sentence in the future or being placed on "Limited Access Status" or having a poor credit rating of 666 or less, will result in loss of voting privileges. These voting rules will basically prevent the lower classes and minority populations from voting, insuring that "Tough on Crime" and "Pro Flea System" candidates will be elected by the Upper Classes making the system stronger and more dangerous. The speed you drive would not only be tracked by the chip in your car, but also by your implanted Flea chip. Passing in an illegal zone, running a red light, accelerating too fast, tailgating to closely, talking on a cell phone if only the driver is in a car or 1,000 other violations, ( which will change daily), will result in an automatic fines drawn instantly from your savings with little recourse in case of error. If you cannot pay the fine instantly the car is disabled remotely by a system like the On-star of today. Car payments more than 30 days behind will result in a remote disabling of the car no matter where it is, with the owner being barred from all public transportation or receiving a ride from anyone else until the payment is made. Anyone giving a ride to these " Credit Scofflaws" will find themselves fined and cars subject to disablement for several days. The Founding Fathers of the United States promised "Freedom of Association". In the near future you will need to explain why you are friends with certain people of bad credit standing or individuals that have committed past crimes. The authorities will know every person you ever contacted or visited by old Cell Phone records and the Flea system as it comes online. Every past crime of everyone you ever came in contact with will be open information by which you will be judged in the future by prospective employers or government "Neighborhood Patriot" members. "Guilt by Association" will become the norm. Every Purchase, Every Bite of Food, Every Book, Every Movie, Every Trip, Every Traffic Violation, Every Website Visited, Every Moment you Worked, Every Phone call sent or received, Every Email, Every Instant Message and Every place you have been and how many times. All the object of intense scrutiny. Computers will create profiles of you based on patterns of working hours, adherence to traffic laws, time spent in exercise, foods purchased and 100 other criteria outside your control to determine your employment desirability, projected productivity and calculated Patriotism. The most horrifying indexes will relate to Patriotism. The Flea device will be the primary device used in many of these Patriotism indexes. To write or speak out against government policies becomes a detriment to these scores. The scores also fall by reading anti-government literature, associating with known unpatriotic persons, and 100 other seemingly arbitrary factors. Falling below a predetermined score will guarantee loss of your job, prohibition against travel on all public transportation, loss of driving privileges, loss of credit and constant interrogations possibly leading to open ended long term imprisonment without a trial or charges of any sort. The first warning shots of World War 3, the information and technology wars have already been fired. The true horrors of this World War Three, the Information and Technology wars, are coming in only a decade or two. Some individuals actually use razors to cut the Flea out of their skin to try to go undetected. But this just denies them access to almost any necessity of life. Anyone lacking the device is easily identified as they enter a building as the heat signature would show the person, but the lack of Flea signal. This will immediately summon the authorities. The violators are forcefully re-implanted with a new device placed on the surface of the Iris in the eye. This allows immediate visual inspection to see if the device is in place. Also, to remove the flea again would result in blinding yourself in one eye. The hopelessness bestowed by the Flea devices over less than perfect individuals will become the driving force behind the suicides and starvation of Hundreds of Thousands of people. The Government ignores the situation as they were the dregs of society anyway. Drug Users, Criminals, Thieves, Uneducated Trash. A leader will actually say "These Suicides save the honest hardworking taxpayer's money, Good Riddance to Bad Rubbish" to promote the Systems effectiveness, without any public outcry. The true future is far worse than any dreamed of by George Orwell in his book "1984". The Flea System is at the core of the future horrors. This World War 3 will kill as many human beings as any war in the past. However, the good hardworking people of America fall victim to the Flea system. The administrators of the system will switch codes to hide their own indiscretions. Innocent citizens will be wrongfully accused and punished without recourse. Small errors in the reporting structure of the system might cause you to lose your job and future overnight. Your family could fall into poverty and starvation. Malicious employees of the Flea System will create false profiles to cause great hardship upon any individual they dislike, at will, without detection. Wake up readers. This is happening already to a limited, yet fast growing extent. Every key word search on any Internet search engine, every web page you ever visit, every e-mail you send or receive is already being preserved and will be used against you to create your Patriotism profiles in the future. Every phone call you make is already being noted forever, but did you know that advanced computers are already scanning and recording millions of conversations? Your GPS equipped cars are already tracking your every move and recording it for the rest of your life. Every turn, every driveway, every store and everywhere else with a time and date stamp. Can you imagine an interrogation 14 years from now demanding why you parked in a particular neighborhood near the home of a future terrorist? Maybe you stopped to check your messages or look at a used car. You better have the exact precise answer or possibly face brutal consequences. The cell phone in your pocket acts as a Flea device in many ways even now. Every move you make geographically with your cell phone is being permanently recorded as potential evidence of crimes or potential future Anti-Patriotism scores. Your debit and credit cards are a permanent record of your buying habits which will never be deleted or destroyed. Imagine being denied employment for your long term habits of buying unhealthy foods. Do you really want your employer or future insurance company to question why you bought so many sugary beverages at the grocery store over that past 8 years? The exact quantities and exact dates. Will you have these answers? You have the power to stop this from happening. Right to Privacy Laws MUST be enacted and enforced now. You must start today or face a life of unimaginable and constant scrutiny of each moment of your life and your children's future lives. The following quatrain is related to the credit information noted near the beginning of this long explanatory note. Will require a 666 Rating. Welcome to the true meaning of World War 3. You, my reader, are already a victim of the now beginning battle of this insidious war. You must stop this World War Three NOW before the danger grows to the point Nostradamus and I have described for you here. Please read all of my archived posts starting with the first. I have been guided into the Future by the soul and spirit of the true Nostradamus. He has revealed to be that I, John Le Sainte, am now his "Voice and Pen" fulfilling an ancient promise made by Nostradamus to return in the 500th year of his birth, to create and share 1000's of new quatrains to our increasingly troubled world. 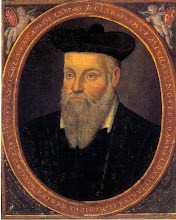 Please Subscribe to and Link to my Nostradamus Predictions Website. Nostradamus Psychic Predictions of the 2008 Presidential Elections John McCain Click Here for the secret SHOCKING Nostradamus Psychic Predictions! To read Nostradamus visions as shown to Psychic John Le Sainte of the Upcoming New York City Earthquake, bridge collapse and train derailment. This Nostradamus prediction of the future New York City Earthquake is interpreted in great detail. Nostradamus Predictions that reveal the TRUE meaning of 666 and the Coming World War 3 three the Information and Technology War as revealed and shown to John Le Sainte by Nostradamus. The mark of the Beast 666 is already upon you as foretold. Nostradamus Predictions about the Nuclear attack by Terrorists as Revealed by the True Living Soul of Nostradamus to Psychic John Le Sainte. This devastating Nuclear attack comes at sea and is revealed in great detail by The Spirit of Nostradamus to the world so that It may be Prevented! • Nostradamus and I , John Le Sainte reveal Predictions of a Nuclear Attack on the world by terrorists coming very soon. Can you write more on this subject as well as the end of the world.